Obsessed may be a mild way to express my love for this stuff. ;) I love to just spoon some out into a small bowl and dip pretzels in it. It is delicious spread over waffles. Or you can do like I do about once a day and just eat a spoonful out of it straight out of the jar. I know some of you may be wondering just what is cookie butter. The best way I can describe it has the consistency of a peanut butter, but with the flavors of a graham cracker, shortbread, and cinnamon and spices. Yum! In large bowl, mix together the oats, walnuts, and coconut. Set aside. Heat the coconut oil in a small saucepan over medium heat. Once melted, still in the brown sugar, honey, salt, and cookie butter. Heat and stir together for 1-2 minutes. Remove from heat and stir in the vanilla. Pour the heated mixture over the oats mixture. Mix well until the oats, walnuts, and coconut are well coated. Spread the granola mixture evenly onto your prepared baking sheet. Bake for about 40-45 minutes, stirring every 15 minutes or so. 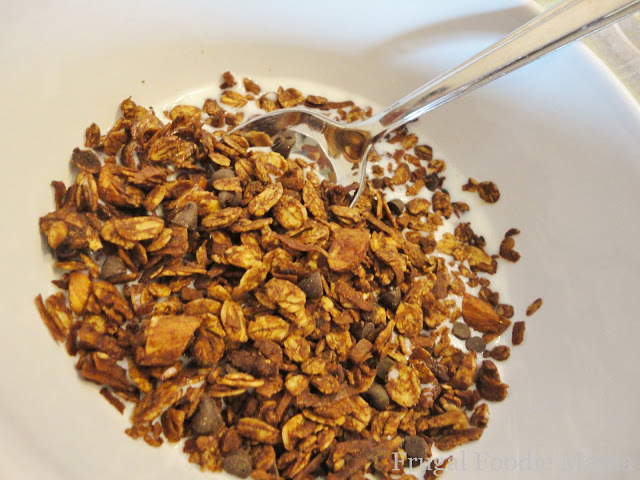 Spread the granola mixture evenly onto your prepared baking sheet. Baking for about 40-45 minutes, stir every 15 minutes or so. Allow to cool and then break into spoon-sized pieces. Store in an airtight container for up to a month. My best friend from high school is coming to visit this week and asked if I wanted anything...I told her cookie butter! She had no idea what it was and went online to look it up. She told me to go look at Walmart, it is on their website. She was right :) Now I can finally try it!!! I think I will start with this granola! Love the idea of cookie butter in granola!! Ahhhh! This sounds SO GOOD! I haven't tried Cookie butter yet and I live close to a Trader Joe's! Crazy, right?! I was just telling my dad I wanted to make some granola for us, so I'll be making this! :) YUM! You are cracking me up with your cookie butter obsession! My husband is a big granola fan, so I might try this recipe for him. I've never had cookie butter, but we do live near TJs so I can get some there. This thing called cookie butter is something I really NEED to try one day. Your granola looks amazing. I've been thinking about making some more granola soon. Pinned to my food board! Whoa! This sounds great! Gotta try it! Pinned this! Thanks for sharing these on Two Cup Tuesday at Pint Sized Baker I hope to see ya again on Monday night! We just got a Trader Joes (well 30 miles away) but at least it is our state! I will pick up some of this yummy Cookie Butter--it looks to fun not to try. 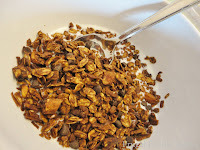 I have several granola recipes on my blog and can't wait to try this one. Carrie this granola is rockin'! I made some this morning to use in one of my #BrunchWeek recipes and I couldn't stop eating it. I can't wait to show you what I did with your granola. Thanks for a great way to use all the walnuts I have.